There’s only one bad thing about cherries: they’re expensive, so you never get to eat enough of them. But at this time of year, when the English crop is ripe and the European harvest is going full tilt, put austerity on hold for a week or two and binge on cherries. Throughout the year, global sourcing offers us shipped southern hemisphere cherries that can have spent three or four weeks in cold storage. A freshly picked cherry, only recently cooled to remove its orchard heat, is quite a different proposition. Assuage your financial guilt by thinking of them as a health food. Who needs sweets when you can pop cherries into your mouth? Why are cherries good for me? 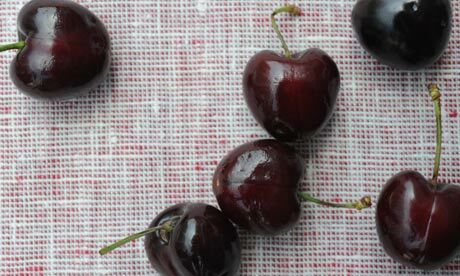 Anthocyanins in cherries appear to have a marked anti-inflammatory action. Specifically, these compounds seem to be highly effective in treating gout, a condition that causes painful swelling in joints. Last year, a Boston Medical Center study reported that eating cherries reduces gout attacks by 35%. Cherries are also one of the few food sources of the hormone melatonin, which regulates sleep patterns. A study published in 2011 in the European Journal of Nutrition, reported that eating tart montmorency (or morello) cherries significantly raised levels of melatonin and improved sleep. Compared to most other fruits, cherries are low in sugar, which makes them an ideal choice for people who want to lose weight. In Kent, Sussex and Herefordshire, our main cherry-growing counties, look out for pick-your-own farms and pop-up cherry stalls on roads through the orchard areas. In shops, expect to pay around £1 per 100g. Two-kilo boxes from greengrocers and markets are much better value, working out at around half that price. Posted on December 8, 2013, in Uncategorized. Bookmark the permalink. Leave a comment.